Adrian and I chose the Berri Cottage Homes because of the central location, affordability, spacious, pleasant and secure surroundings. We enjoy being close to shops, banks, medical facilities and the recreational facilities. 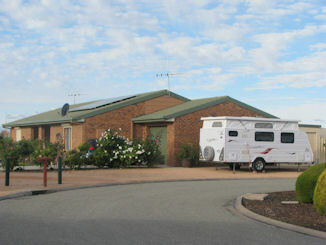 Berri Cottage Homes allows Adrian and I the company of other residents whilst also enjoying our independence. I love living here. It's great knowing you can travel whenever you want and know that your place is being looked after and maintained while your not here. Copyright 2019. All Rights Reserved by Berri Cottage Homes. Site created by KarBec Computing.